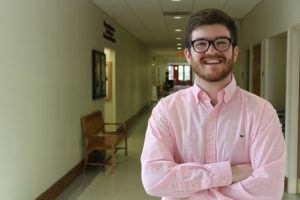 “Most people give a firm handshake or sign on a dotted line in an attempt to prove they’ll keep their word in an agreement,” says Summer Scholar and SJU junior Cameron Kenworthy. “But how are businesses really held accountable?” Cameron is spending the summer trying to answer this question. Her research focuses on the impact of a plant operated by Nestle Waters, producer of the brand Arrowhead, that is located on a reservation in Southern California. Despite operating under a mission of environmental and social responsibility, the plant has been under scrutiny for the amount of water they have used amid severe droughts in the region over the last four years. 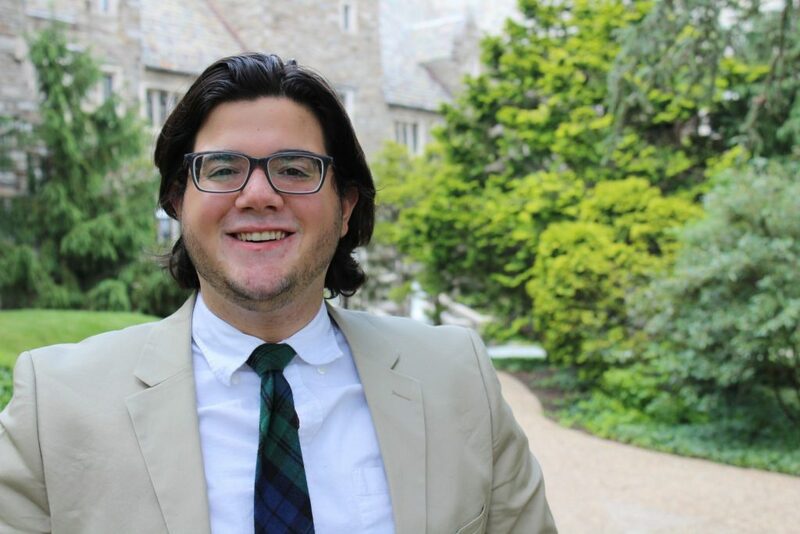 “Indigenous people who reside on the reservation, as well as those across the world are being affected by this,” says Cameron, a psychology major with a minor in Leadership, Ethics and Organizational Sustainability (LEO) from Hagerston, Maryland. “I am investigating the inconsistencies between the company’s promise and its action,” says Cameron, “as well as the trying to identify ‘greenwashing’ practices.” Greenwashing occurs when a company spends time and money in an attempt to present an environmentally responsible image to consumers, often deceivingly. Cameron’s mentor for the project, João Neiva de Figueiredo, Ph.D., associate professor of international business and LEO, was one of the first to encourage her to explore her interest in issues of corporate social responsibility. “As consumers become increasingly focused on sustainability, it is in companies’ interest to project a socially and environmentally responsible image. The important question is what corporations do when there are conflicting incentives among the people, planet, and profit dimensions,” he says. “I chose this topic because I think all too often people tend to accept big business for what it is, without questioning how the business interacts with the communities it may be affecting,” says Cameron. She hopes that the people who read her work will become just as passionate about these issues. 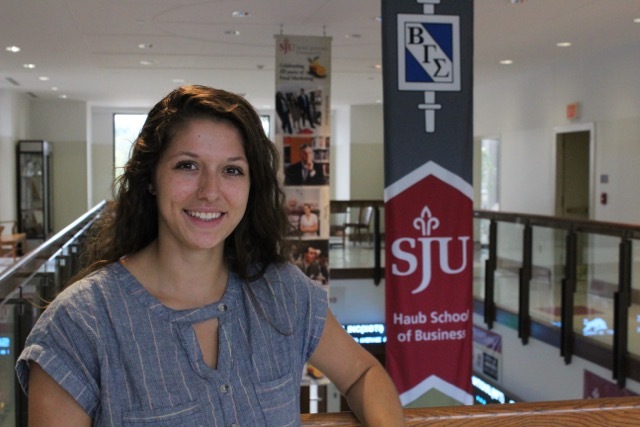 Summer Scholar and SJU rising junior Meaghan Cherewka is studying what happens when companies fail to balance competing priorities — like social consciousness and the bottom line. Her research focuses on hybrid organizations, defined as companies that “combine the social logic of a nonprofit with the commercial logic of a for-profit business” (Working Knowledge, Harvard Business School). In particular, she is studying Ben & Jerry’s, a company equally as famous for its social justice platform as for its delicious creations. Founded more than 20 years ago by creators who defined their mission through a lens of corporate social responsibility, the business has faced challenges to maintaining this identity as it grew. After becoming a publicly traded corporation in 2012 and experiencing a series of leadership changes, Ben & Jerry’s struggled to balance its mission focus with its profit growth. “My research examines the institutional logistics that make up this hybrid organization and how future companies can learn from Ben & Jerry’s mistakes when balancing these competing goals,” says Meaghan. 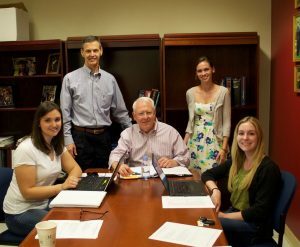 Her project was inspired by her mentor, Kenneth Kury, Ph.D., assistant professor of family business and entrepreneurship, who also helped guide her course of study in HSB. 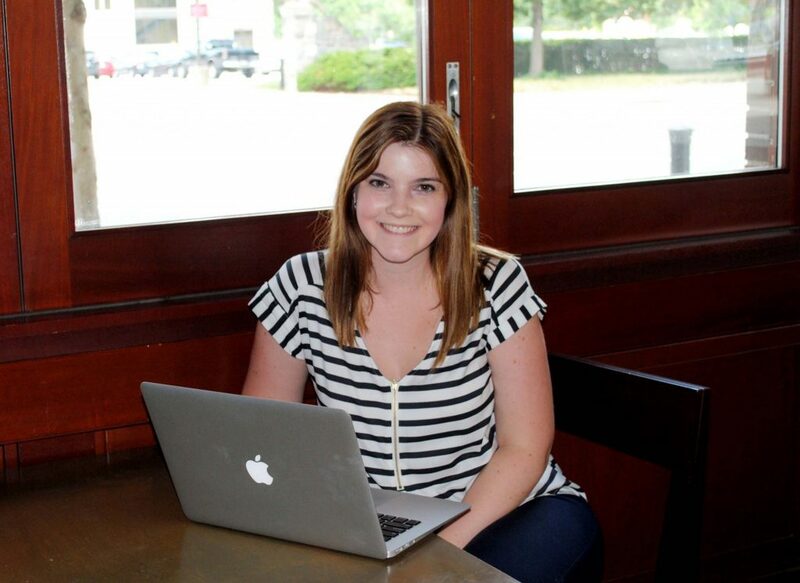 After taking his freshman seminar, Meaghan decided to double major in entrepreneurship and marketing and apply for the Summer Scholars Program. Having researched and delivered talks on the topic himself, including a presentation, “The Relationship Between Social Capital and Resource Acquisition in Social Entrepreneurship,” at the Satter Conference on Social Entrepreneurship in New York in 2009, Dr. Kury has been a great partner for Meaghan’s project. “[Summer Scholars] allows you to work hand-in-hand with a professor on multiple drafts, collaborating to come up with ideas you may not have otherwise,” says Meaghan. Meaghan and Dr. Kury will be submitting the paper, once completed, to be considered for presentation at the National Convention for Entrepreneurship. 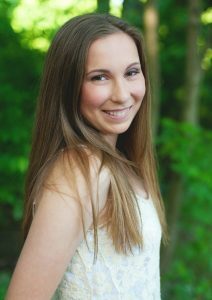 A member of the SJU cheerleading squad, the Alpha Omicron Pi sorority and the American Marketing Association, Meaghan is a volunteer with Make-A-Wish and Relay for Life. According to PwC’s Global Economic Crime Survey, published this past February, 54 percent of U.S. companies that responded to the survey have experienced some type of cybercrime, but close to half of those companies do not have or have not yet implemented a plan to respond to attacks. Philomena is studying why businesses often downplay the threat of cybercrime, even as they lose millions of dollars and experience significant damage to their reputations as a result of these incidents. 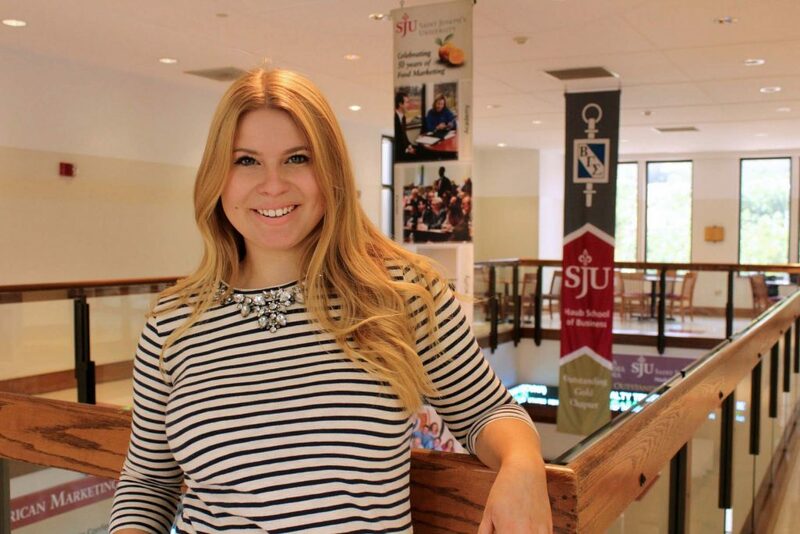 The vice president of SJU’s accounting society was turned on to this topic at a networking event where she had the opportunity to speak with forensic accountants about cybersecurity. She brought the topic to her now summer scholar mentor, accounting chair and professor Joseph Larkin, Ph.D., who encouraged her to run with it. “Cybercrime should absolutely be a concern of not only the business world, but also for the entire world, as it impacts all of us,” adds Larkin. In addition to her summer scholar work, Philomena is a sister of Alpha Gamma Delta sorority and an intern with Vigilant Compliance, LLC. Many SJU Summer Scholar projects are born of a single student’s curiosity or a moment of inspiration in the classroom. But others, like the work of pharmaceutical marketing majors Caitlin Smith ’17 and Olivia Capperella ’18, contribute to bodies of academic research years in the making. Along with rising junior Claudia Barbiero, who serves as the group’s database administrator, Caitlin and Olivia are members of a research team examining the media’s portrayal of the pharmaceutical industry. Led by Associate Dean of the Haub School of Business and Professor of Management Stephen Porth, Ph.D. and Chair and Associate Professor of Pharmaceutical and Healthcare Marketing, George Sillup, Ph.D., the scholars analyze articles from the previous year that ran in top national newspapers and included mention of the industry. The project is in its 13th year. Caitlin, who has been working alongside Dr. Sillup and Dr. Porth for the past three years, says they examine the articles in batches and determine the slant and key topics. “We note the companies, healthcare systems and drugs mentioned and the ethical issues discussed or implied in the articles,” she says. 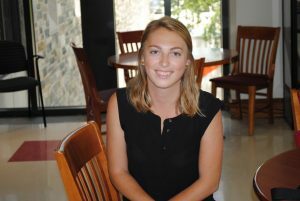 “When we look at the top issues in the industry or questions of ethics, we use a legend that has evolved with the study and add new matters as they make headlines,” adds Olivia, who also has a major in business intelligence and analytics. For example, the group tracked the peak in news coverage of the Ebola crisis (the first US case of which was reported in September 2014) and in issues related to the Zika virus, the news of which broke in early 2015. Though a longstanding project, the study has evolved over the last decade as both the pharmaceutical and media industries have changed. “This year, we’ve added social listening to the study, examining Google trend analysis, keywords about the industry and hot topics,” says Dr. Porth. Results of the study are published annually in Pharma Executive, a major publication for the pharmaceutical industry, according to Dr. Sillup. In addition to working on this research, Caitlin and Olivia are also both interns at Aztra Zeneca and members of SJU’s chapter of PILOT (Pharmaceutical Industry Leaders of Tomorrow), of which Olivia is vice president. In pursuit of those solutions, Meghan, who also has minors in Spanish and economics, has been spending the summer exploring issues of corporate social responsibility within clothing companies. She hopes to gain a better understanding the complexities of the industry and assess strategies for encouraging conscientious consumers. On the consumer side, Meghan’s research is focused mainly on the need for increased awareness among millennials. 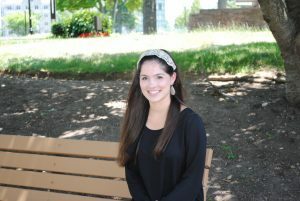 Meghan’s eagerness to learn more about these issues led her to apply for Summer Scholars. “The Summer Scholars Program is a unique opportunity to explore an academic topic in depth with both independent freedom and guidance from a well-respected professor,” she says. 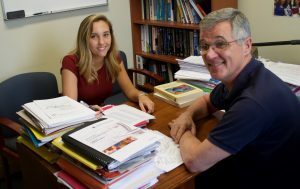 Meghan is working with João Neiva de Figueiredo, Ph.D., an associate professor of management at Saint Joseph’s who has a background in business economics and teaches courses on topics such as organizational sustainability and global business strategy. Meghan hopes their research can contribute to the call for better labor standards and more sustainable practices internationally. She just returned from a semester abroad in Madrid, where, in addition to completing coursework, she was able to continue her weekly service participation. Back at home, Meghan is reengaged with her roles as an active ELS volunteer, a big sister with the Soith Eastern chapter of Big Brother Big Sister, a member of the SJU International Business Society and an intern for Profugo, an international development nonprofit in Ardmore.